Situated at a distance of 42 km and 15 km from Bhubaneswar and Khurda respectively, Atri is famous for its hot sulphur spring which attracts thousands of tourists every year. The water remains at a constant temperature of 55 degrees Celcius. 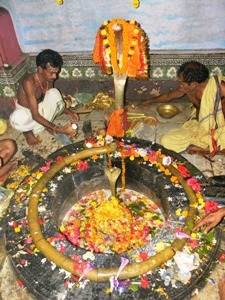 The water is said to have medicinal properties, and bathing at Atri also has religious significance, as it is located only at a distance of half a kilometer from the Lord Hatakeswar temple, believed to be established by God Ram himself.It is believed that the hotspring is connected with the shaktipitha of the temple through an underground road. Every year on the days of Makara Sankranti, Shivaratri and Dolo Purnima special festivals are observed here which draw a large number of devotees to this place. The journey to Atri is very pleasant as the road leading to Atri passes through scenic countryside where neem, banyan, and peepul trees are seen in abundance.